We’d love your help. 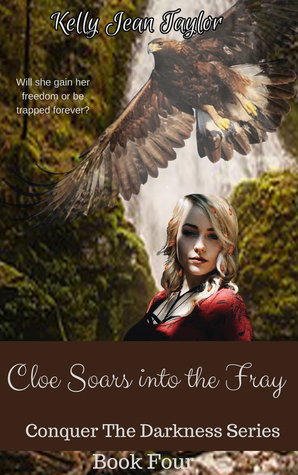 Let us know what’s wrong with this preview of Cloe Soars into the Fray by Kelly Jean Taylor. An well-known actress performing on the set of a new movie, Cloe Callaway finds herself thrust into a world no other could comprehend. Struggling with a past she can’t forget, her paranoid nature ensures she is safe at all times. As she struggles with memories of the past, she must come to grips with the fact that her past will always chase her unless she finds the courage An well-known actress performing on the set of a new movie, Cloe Callaway finds herself thrust into a world no other could comprehend. Struggling with a past she can’t forget, her paranoid nature ensures she is safe at all times. As she struggles with memories of the past, she must come to grips with the fact that her past will always chase her unless she finds the courage to face it. To ask other readers questions about Cloe Soars into the Fray, please sign up. My journey has led me to this moment, this time and this adventure. I forge forward to provide great stories and helpful information to those who were one in my position. Searching and yearning for something more. To those searching, keep to your journey. You'll reach your destination. Enjoy the adventure, learn from the obstacles, and strive for your dreams.